← The Fencing weekend……finally ! 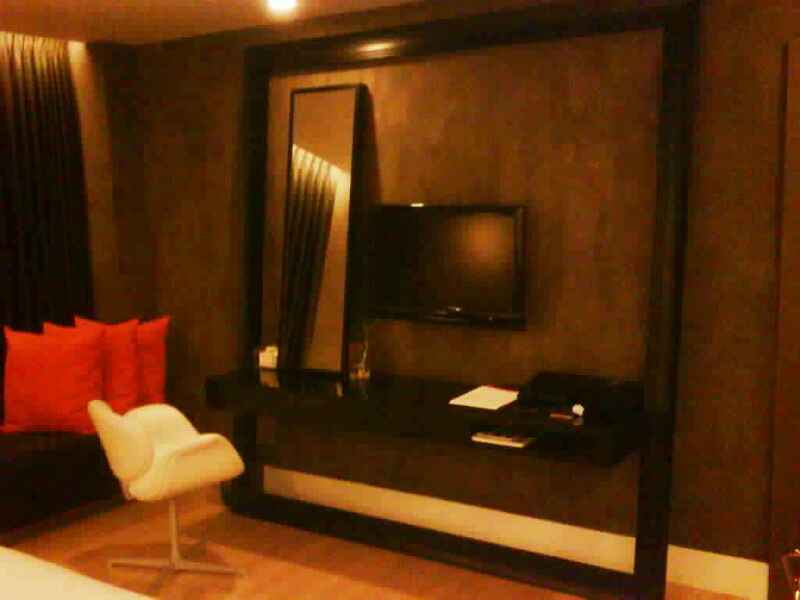 Last week the boss and I jetted out for a some business in Bangkok. An easy short hop over on Wednesday night and we were soon in Silom Square which is an area I have never stayed in before. The plan was to stay with Brett in his palacious 5 bedroom / 27th floor apartment but Rob’s wife came at the last minute I got billeted in the VERY swish GLOW Hotel directly across the road.The room was insanely nice with the most comfortable bed I have ever been in, a massive flat screen, iPod dock, fresh towels and robes and ash blonde polished floors and a day lounge. After a couple of quick lagers at Brett’s place we all headed over to the infamous Patpong Road ( a mere 300m away !) for a great feed in a restaurant whose name escapes me but it was kind of Spanish in appearance and id a wicked Lasagna and Pizza . Nobody could believe I had never been to Patpong Road during my many visits to Bangkok. I am creature of habit and I always stay up on the River near Khao Sahn Road. Patpong was all of the same stuff and then obviously a bit more. There is a night-market selling all manner of fare and then..the go go bars. Hawkers try to tempt you with signs offering all manner of bizarre shows. Some are just downright aggressive and follow for 100m. A simple “mate….I live in Cambodia” has the desired effect and they drop off like flies. Hell….you can even play ping pong while you are there !? 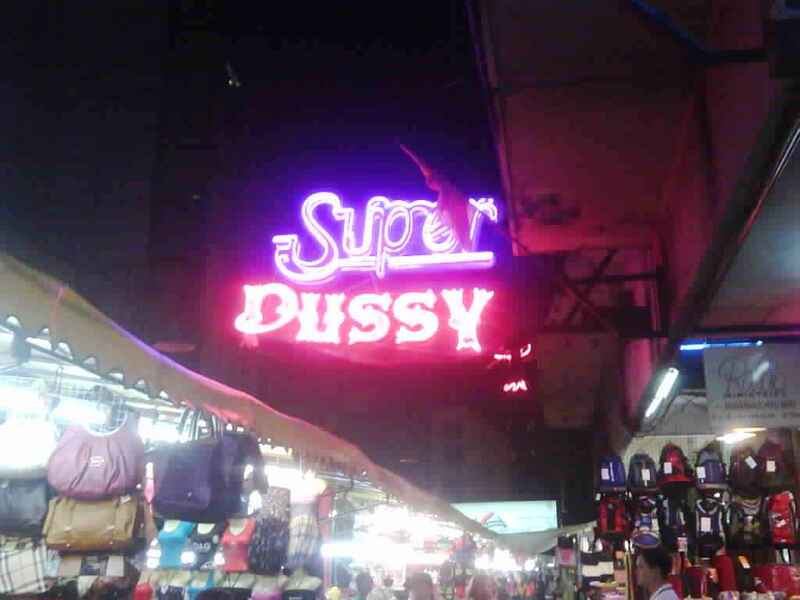 Patpong's most photographed sign ? Apparently that brought the house down and Mom was left asking her husband what she had said wrong ! Brett’s parents were such good sports they insisted on visiting said restaurant and viewing said sign for themselves when they eventually visited Bangkok themselves. Hilarious. After dinner we went over to an Irish pub and played some pool and then with a big day of trade shows coming up, we all hit the hay early. Thursday saw Rob,Brett, ChiChai ( Bretts offsider ) and I out at the Building Maintenance and Asset Management ( BMAM) show. It was a bit of a let down with only a few vendors of any interest including one that sold a galvanized livestock fencing system that would be perfect for the land in Kep. Some of the exhibitors plain did not even show up and many of the stalls were staffed by clueless Katoeys . Around 1pm we hit the…wait for it….Irish Pub at the convention centre and we all ordered what turned out to be a superb Beef and Guinness Pie. Brett and I headed back in to town and I then headed over to MBK for some quick shopping. That night I ventured out alone and had a really good Mexican nosh at Cantina right at the entrance to Patpong Road. For about $12 I had two enchiladas and 3 pints and the atmosphere was very amusing. A bunch of older Australian guys obviously on tour kept everyone amused with their antics and karaoke renditions of famous Australian songs and I pitied the go-go bar that they were going to end up in. After a few beers I headed home exhausted figuring that the following night, Friday night, would be a big one as we had more crew arriving in to Bangkok from Phnom Penh and London. I was not wrong. Friday we head out to the Renewable Energy show and this is a much slicker affair than the BMAM. More Katoeys ( not just more…I mean more in sheer numbers )and many more visitors and exhibitors. By 1pm it is absolutely bucketing down and again Brett and I head back in to town,leaving Rob and a few others to continue. I take the last opportunity for some quiet time by grabbing my book and heading in to the lovely Japanese restaurant in the foyer of my hotel where I order a bowl of Soba noodles and a San Miguel Pilsener. It is a very reasonable $10 or so. Come 4pm we marshal at Brett’s HQ. His 3 mates from London have arrived as has Rob Matteo, one of our other companies GMs in Cambodia. We head for the sky-train and several stops later we are on Soi 33 and in the Office Bar for the Geelong vs Collingwood semi-final. So are about 200 other Aussies and the afternoon is a blast as we do our bit to keep Heineken from losing market share, perv at the insanely hot waitresses and generally have a great laugh. 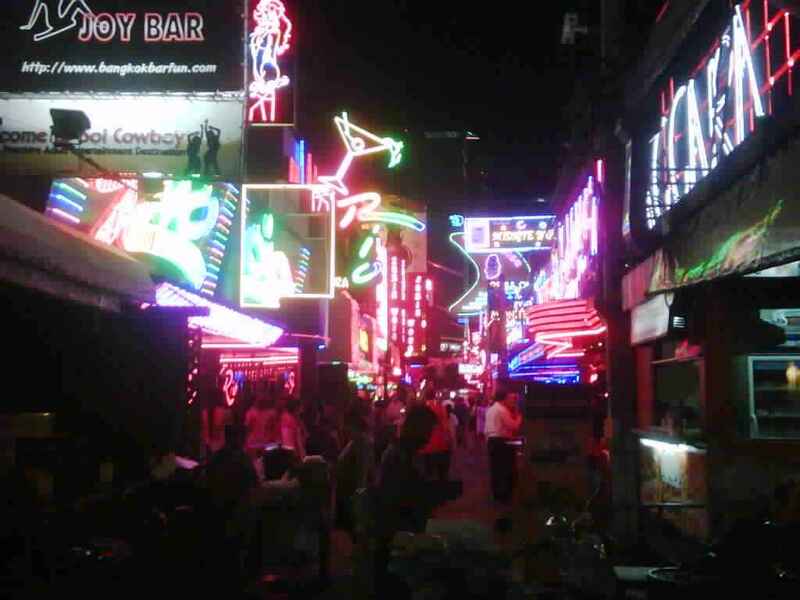 We roll on to a few other bars and the we head to Soi Cowboy, the upmarket version of Patpong. The next few hours sees our intrepid team catapult from bar to bar like a bunch of pinballs in a big machine. Long Gun, Suzie Wongs,Dollhouse and my personal favorite Baccara with it’s persepex ….ahem…upper floor.The night is hilarious with one of the English lads getting buck naked on stage at Long Gun but all in all good clean fun and we all arrive home safely at 2am. Dollhouse - telling it how it is !